How, how on earth is it possible that we spend years teaching children about geography, places, people, culture, diversity, travel, and that we do it all with a world map that is completely wrong – and not just by a little bit ?! After a few minutes I ended up on the True Size website which completely turned my world inside out, and reminded me of a lot of high-school geography and Trivial Pursuit that I have forgotten. Take 5 mins – right now. I promise it will be worth it. If you have a 5 minute break, kick back and start playing around on this site. Prepare to be shocked. (As a warning, the site is addictive but once you get started it makes for the best dinner table trivia questions. So once you’ve educated yourself you can awe your friends with your new intelligence and worldly relativity). What is the true size of China? Or of the USA? Here China and the USA are overlaid geographically on top of South America… just a little sneak peek at what True Site can do, and demonstrating how today’s world map completely warps out perception of the northern and southern countries compared to the equatorial regions. It definitely makes you realise why those South America bus trips across the continent take so long…. The true size of Russia? The first image is what I had in my mind, coming from the “standard map” view. 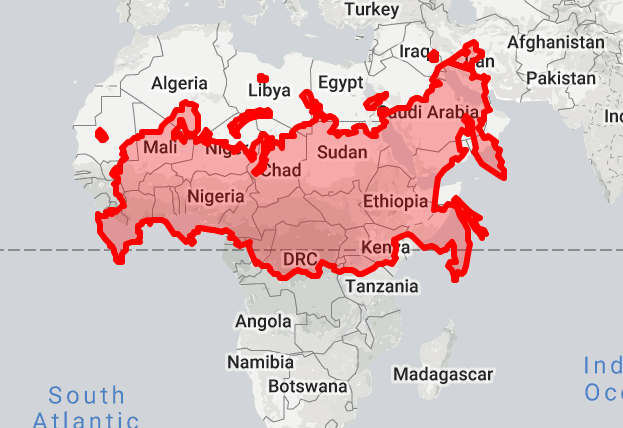 The second image is the “true size” overlay putting Russia on Africa, just for perspective. AFTER: Russia from the true-size perspective. There’s only one way to fix this – with a spherical map. Thats why a globe is not just a beautiful living room decoration, it is a necessary classroom and living-room tool. Previous Snakes, frogs, and poison with a great visitor guide? Sign me up.